There is a wide range of laboratory baths that are ideal for chemical experimentation in different industries. SGM water baths are manufactured using superior quality raw material, and insulated using superior quality glass wool. Any baths that work above 100oC will need a liquid in them such as oil. Any baths that work below ambient will need an internal or external cooling system. If they work below the freezing point of water they will need to be filled with a suitable anti-freeze solution. 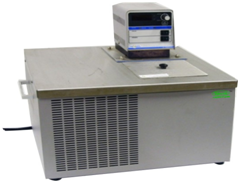 If you require very accurate control you require the laboratory stirred baths with accurate thermostat / circulator.